Todd's new CD will be called "White Knight" and will be available May 12, 2017. It is said to be a "game changer." Watch the video clip of Todd’s electrifying performance of “Black Maria” as featured on the upcoming release. For full track listing, artwork and live photos, visit the official “Live At The Ridgefield” UK web release page - www.noblepr.co.uk/Press_Releases/toddrundgren/live-at-the-ridgefield.htm. Todd has recorded a studio version of The Beatles' "You've Got To Hide Your Love Away" for the upcoming Keep Calm and Salute the Beatles. Take a listen! Todd's new album, Global is out now and coming May 5 is his collaboration with Hans-Peter Lindstrøm and Emil Nikolaisen called Runddans. It's set for a May 5 release via Smalltown Supersound. The album is one 39-minute track that's broken down into 12 different parts. Todd will release his new studio CD "State" on April 9, 2013. His tour in support of the release will begin in May and continue throughout 2013. The CD is available for pre-order now at toddstore.com. Cherry Red Records’ frontline label Esoteric Antenna is proud to announce that the legendary TODD RUNDGREN has signed to the label for a worldwide deal for the release of his next studio album. Todd Rundgren is a true original in popular music. A highly creative and diverse musician, his work has earned him a vast and loyal global following and immense respect from his musical peers. As a songwriter, video pioneer, producer, recording artist, computer software developer, conceptualist, and interactive artist, Rundgren has made a lasting impact on both the form and content of popular music. His production work with such stylistically diverse artists as MEAT LOAF, NEW YORK DOLLS, PATTI SMITH, GRAND FUNK RAILROAD, THE TUBES, XTC, CHEAP TRICK, PSYCHEDELIC FURS, AND HALL & OATES has firmly placed him among the gifted elite of musicians and producers. 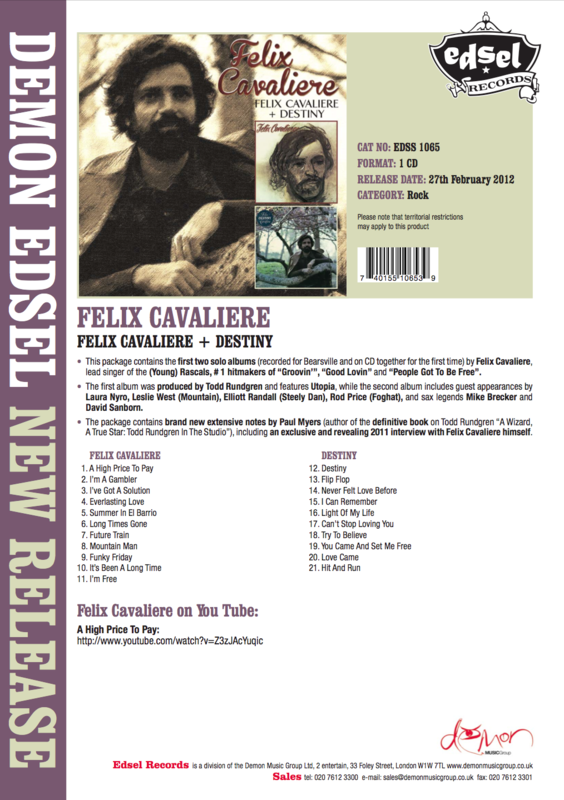 The next set of Edsel re-releases is set for February 27, 2012. Amazon.com will have them available in March, 2012. 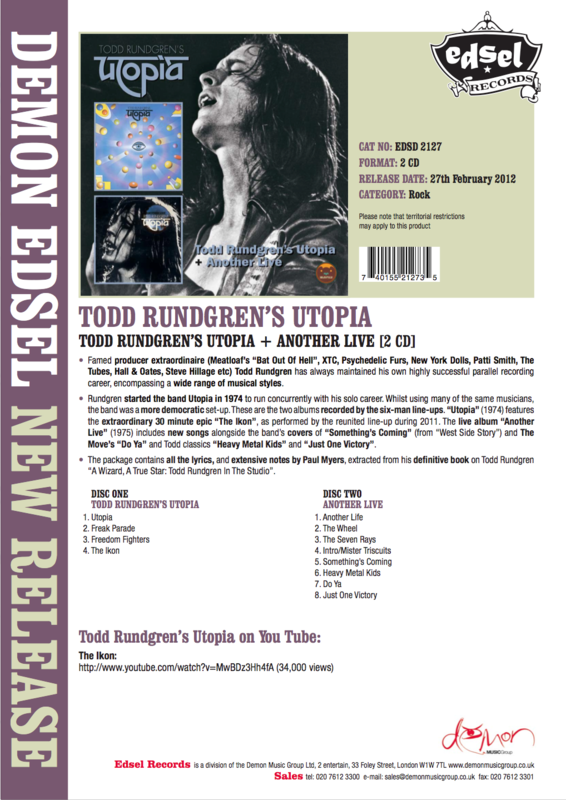 Shout Factory is set to release Todd Rundgren’s Utopia Live At Hammersmith Odeon ’75 concert CD on April 10. Recorded on October 9, 1975, at the Hammersmith Odeon in London, Todd Rundgren’s Utopia Live At Hammersmith Odeon ’75 captures the band performing their first UK concert. The recording has never been commercially available until now. 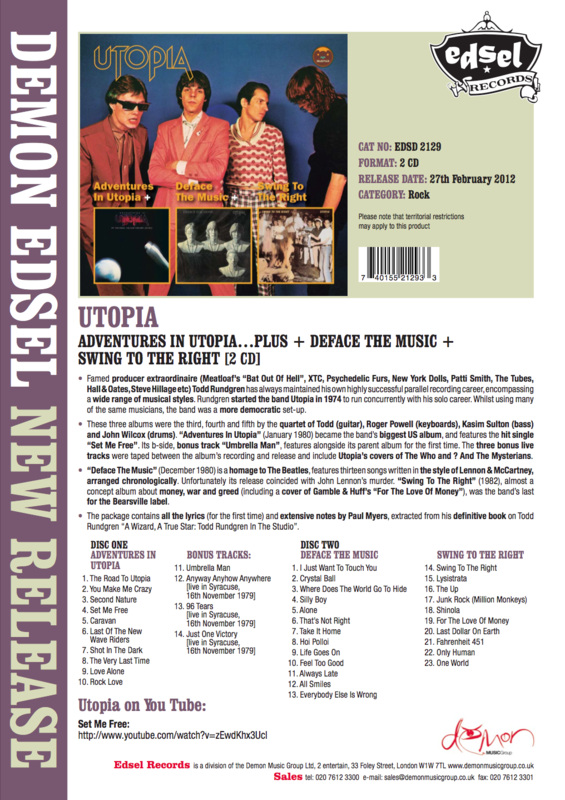 The recording features the lineup of Todd Rundgren, John Siegler, Roger Powell and Willie Wilcox, which would later become Utopia, with backing vocals by Luther Vandross and Anthony Hinton. Cherry Red Records and their imprint Esoteric Recordings are extremely proud to announce the acquisition of TODD RUNDGREN’s unique and extensive personal audio and visual archive of live and studio recordings covering material recorded and filmed between 1976 and 1995. Todd Rundgren is a true original in popular music. A highly creative and diverse musician, his work as a solo artist and with the band UTOPIA has earned him a vast and loyal global following and immense respect from his musical peers. His production work with stylistically diverse artists such as MEAT LOAF, NEW YORK DOLLS, PATTI SMITH, THE BAND, THE TUBES, XTC et al has also set him among the gifted elite of musicians and producers. The extensive Rundgren archive features a host of unreleased audio and visual concert recordings, of Todd’s solo work and Utopia. 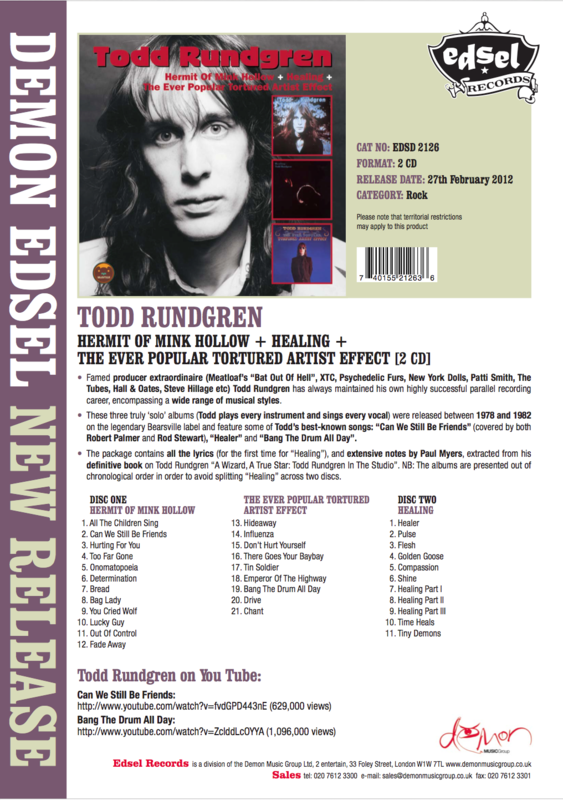 Esoteric Recordings label manager Mark Powell said; “It really is an honour for all of us at Esoteric and Cherry Red to be given the chance to work with rare recordings of such a ground-breaking icon as Todd Rundgren. As a fan of Todd’s, the chance to prepare a series of unique releases of unreleased material, beginning in the early months of 2012, is a privilege”. Further announcements will be made as releases are prepared, but Esoteric plan a series of CD and DVD collections with deluxe packaging, extensive liner notes and the finest audio and visual quality. Aside from TODD RUNDGREN and UTOPIA releases, Esoteric’s release programme will also include a full release of the rare and unreleased DISCO JETS album, a UTOPIA side project from 1978. 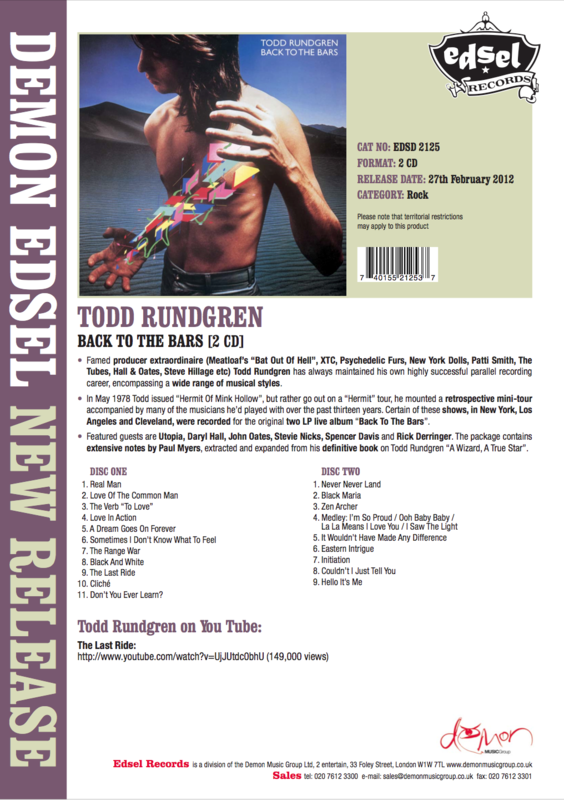 A Wizard, A True Star: Edsel Rolls Out Todd Rundgren Catalogue Overhaul outlines the upcoming reissue of much of Todd's back catalog in the UK with bonus tracks. 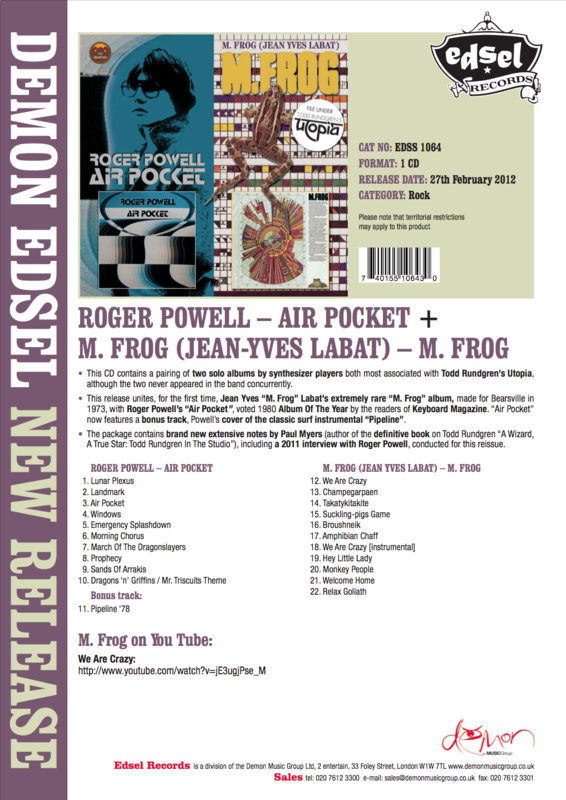 New liner notes are written by Paul Myers. Esoteric Recordings, a label of Cherry Red Records based in the UK, will be reissuing the Utopia albums "Oblivion", "POV" and "Redux '92 - Live in Japan" on January 31st 2011. All releases are deluxe packages and feature liner notes with a new exclusive interview with Todd Rundgren. "Oblivion" features a bonus DVD with a remastered version of "Live at the Royal Oak" and the "Cry Baby" promotional film. "Redux '92" will also include a remastered DVD of the Tokyo concert. The DVDs are NTSC Region Free and can be viewed in the USA. The "POV" CD features the tracks "Man of Action", "Fix Your Gaze" and "Monument" as bonus tracks. More press from the Fantasy Camp: Todd Rundgren and Fans Get in Studio for myRecordFantasy. Reports of a new album in the works are revealed in the article Gigatone Signs Rock Icon Todd Rundgren. Todd will reportedly record the album at the Track Shack Studios based in Sacramento, CA and there will be some level of fan participation in a three-day Fantasy Camp. Other live "bootleg" Todd Rundgren have come out before, but this is the first one officially sanctioned by Todd. And, not coincidentally, none of those cheap impostors have offered the breadth of this exclusive 3-CD set, both with respect to the material, geopraphy and chronology! Inside this 3-CD set are 42 tracks spanning the years 1971-2006, taken from shows in the U.S., Europe and Asia, so you get to hear a lot of different tours, a lot of different bands, and a whole host of Todd treats! Among the highlights: 'Hello It's Me' from the Bottom Line in NYC 1978; 'It Wouldn't Have Made Any Difference' from Sigma Sound Studios in Philadelphia 1971; 'Black Maria' and 'Open My Eyes' from the Fox Theatre in Atlanta in 1973; 'I Saw the Light' from Levon Helm's Studio in Woodstock in 1981; 'A Dream Goes On Forever' from the Agora in Cleveland in 1982; 'Bang on the Drum' from the Park West in Chicago in 1993; 'Love of the Common Man' from the Ruth Eckerd Hall in Clearwater, FL in 2003; 'The Seven Rays' from the Shaboo Inn in Willimantic, CT in 1978, and much more. A must for Rundgren fans! "Todd Rundgren's Short Johnson" three-song sampler is available as an MP3 download from Amazon.com and iTunes. "It should be available at all major retailers except Target. Definitely at Best Buy, Barnes & Noble, Borders, etc. Todd's fans can be a great help if they can tell us the names of stores which don't have it (specific street address)." Please pass the word. They can let Lynn Robnett at Eric Gardner's office know if their store (except Target) doesn't have it. Todd Rundgren/Utopia: The Todd Rundgren and Utopia archive features approximately 2,000 never-before-released live recordings, demos, out-takes, and alternate versions from 1977 to 2000. It also includes a significant array of never-before seen video footage as well. Rundgren, both an accomplished songwriter and producer whose hits "I Saw the Light," "Can We Still Be Friends," "Hello, It's Me," and "Bang the Drum" vaulted him from a cult following to stardom, formed Utopia in the mid-1970s. The archive includes never before seen or heard rare audio and video performances from both Rundgren as a solo artist and Utopia. The first of these previously unreleased audio and video performances will be released in the summer of 2007. Todd Rundgren appears on the Harry Smith Project: Anthology American of Revisited 2-CD/2-DVD box set and the Harry Smith Project Live DVD, available separately. Both releases, in stores now, feature highlights from a series of Harry Smith tribute concerts staged in London, New York and Los Angeles by Hal Willner in 1999 and 2001. Ethel, the string quartet which toured with TR and Joe Jackson, have a new CD out. It's called "Light." People can grab it on iTunes, Amazon, or on the Cantaloupe site. In a couple of upcoming releases, TR's work is featured. On the "Bat Out Of Hell III" release from Meat Loaf (due out October 31), TR provided the vocal arrangements. On the Harry Smith 4-disc tribute (out October 24), TR duets with Robin Holcomb on "House Carpenter." Castle Music will release the electrifying new live album from one of music's greatest singer/songwriters and performers, Todd Rundgren. Entitled 'Best of Todd Rundgren - Live', and digitally remastered by Rundgren himself earlier this year, the album includes 13 of his best songs culled from the Rundgren archives over various tours from 1979 to 2004. The album will be released in North America by Sanctuary Records on Tuesday November 15, 2005, while Castle Music via Sanctuary will release the album in the UK and the rest of Europe Monday November 21, 2005. The album includes two recent live tracks recorded during 2004's Todd Rundgren & The Liars tour - 'Soul Brother', originally released on 2003's critically acclaimed 'Liars' album, and a stunning rendition of George Harrison's 'While My Guitar Gently Weeps', both of which will be included on the forthcoming "Todd Rundgren and the Liars - Live" DVD (the latter released in the US on Tuesday November 29, 2005, and released in the UK/Europe early 2006). Liars LIVE is now available at Amazon.com for pre-order. Release date is set for November 29, 2005. Greetings from the Will Powers Institute. Thanks and remember - Where there's Will, there's a way!